A shell is a payload-carrying projectile that, as opposed to shot, contains an explosive or other filling, though modern usage sometimes includes large solid projectiles properly termed shot. [not verified in body] Solid shot may contain a pyrotechnic compound if a tracer or spotting charge is used. Originally, it was called a "bombshell", but "shell" has come to be unambiguous in a military context. Shells are usually large-caliber projectiles fired by artillery, combat vehicles (including tanks), and warships. Shells usually have the shape of a cylinder topped by an ogive-shaped nose for good aerodynamic performance, possibly with a tapering base (boat-tail), but some specialized types are quite different. 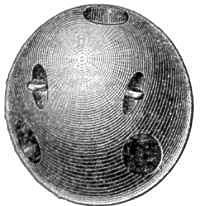 Solid cannonballs ("shot") did not need a fuse, but hollow munitions ("shells") filled with something such as gunpowder to fragment the ball, needed a fuse, either impact (percussion) or time. Percussion fuses with a spherical projectile presented a challenge because there was no way of ensuring that the impact mechanism contacted the target. Therefore, shells needed a time fuse that was ignited before or during firing and burned until the shell reached its target. Written evidence for early explosive shells in China appears in the early Ming Dynasty (1368–1644) Chinese military manual Huolongjing, compiled by Jiao Yu (fl. 14th to early 15th century) and Liu Bowen (1311–1375) sometime before the latter's death, a preface added by Jiao in 1412. As described in their book, these hollow, gunpowder-packed shells were made of cast iron. At least since the 16th century grenades made of ceramics or glass were in use in Central Europe. A hoard of several hundred ceramic grenades were discovered during building works in front of a bastion of the Bavarian city of Ingolstadt, Germany dated to the 17th century. Lots of the grenades contained their original blackpowder loads and igniters. Most probably the grenades were intentionally dumped in the moat of the bastion before the year 1723. 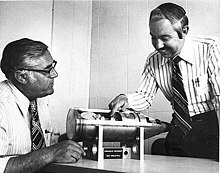 An early problem was that there was no means of precisely measuring the time to detonation — reliable fuses did not yet exist and the burning time of the powder fuse was subject to considerable trial and error. Early powder burning fuses had to be loaded fuse down to be ignited by firing or a portfire put down the barrel to light the fuse. Other shells were wrapped in bitumen cloth, which would ignite during the firing and in turn ignite a powder fuse. Nevertheless, shells came into regular use in the 16th century, for example a 1543 English mortar shell was filled with 'wildfire'. By the 18th century, it was known that the fuse toward the muzzle could be lit by the flash through the windage between the shell and the barrel. At about this time, shells began to be employed for horizontal fire from howitzers with a small propelling charge and, in 1779, experiments demonstrated that they could be used from guns with heavier charges. The use of exploding shells from field artillery became relatively commonplace from early in the 19th century. Until the mid 19th century, shells remained as simple exploding spheres that used gunpowder, set off by a slow burning fuse. They were usually made of cast iron, but bronze, lead, brass and even glass shell casings were experimented with. The word bomb encompassed them at the time, as heard in the lyrics of The Star-Spangled Banner ("the bombs bursting in air"), although today that sense of bomb is obsolete. Typically, the thickness of the metal body was about a sixth of their diameter and they were about two thirds the weight of solid shot of the same caliber. To ensure that shells were loaded with their fuses toward the muzzle, they were attached to wooden bottoms called sabots. In 1819, a committee of British artillery officers recognized that they were essential stores and in 1830 Britain standardized sabot thickness as a half inch. The sabot was also intended to reduce jamming during loading. Despite the use of exploding shell, the use of smoothbore cannons firing spherical projectiles of shot remained the dominant artillery method until the 1850s. The mid 19th century saw a revolution in artillery, with the introduction of the first practical rifled breech loading weapons. The new methods resulted in the reshaping of the spherical shell into its modern recognizable cylindro-conoidal form. This shape greatly improved the in-flight stability of the projectile and meant that the primitive time fuzes could be replaced with the percussion fuze situated in the nose of the shell. The new shape also meant that further, armor-piercing designs could be used. During the 20th Century, shells became increasingly streamlined. In World War I, ogives were typically two circular radius head (crh) - the curve was a segment of a circle having a radius of twice the shell caliber. After that war, ogive shapes became more complex and elongated. From the 1960s, higher quality steels were introduced by some countries for their HE shells, this enabled thinner shell walls with less weight of metal and hence a greater weight of explosive. Ogives were further elongated to improve their ballistic performance. The piece was rifled, which allowed for a much more accurate and powerful action. Although rifling had been tried on small arms since the 15th century, the necessary machinery to accurately rifle artillery only became available in the mid-19th century. Martin von Wahrendorff and Joseph Whitworth independently produced rifled cannon in the 1840s, but it was Armstrong's gun that was first to see widespread use during the Crimean War. The cast iron shell of the Armstrong gun was similar in shape to a Minié ball and had a thin lead coating which made it fractionally larger than the gun's bore and which engaged with the gun's rifling grooves to impart spin to the shell. This spin, together with the elimination of windage as a result of the tight fit, enabled the gun to achieve greater range and accuracy than existing smooth-bore muzzle-loaders with a smaller powder charge. In 1878, the British adopted a copper 'gas-check' at the base of their studded projectiles and in 1879 tried a rotating gas check to replace the studs, leading to the 1881 automatic gas-check. This was soon followed by the Vavaseur copper driving band as part of the projectile. The driving band rotated the projectile, centered it in the bore and prevented gas escaping forwards. A driving band has to be soft but tough enough to prevent stripping by rotational and engraving stresses. Copper is generally most suitable but cupronickel or gilding metal were also used. In 1884, Paul Vieille invented a smokeless powder called Poudre B (short for poudre blanche—white powder, as distinguished from black powder) made from 68.2% insoluble nitrocellulose, 29.8% soluble nitrocellusose gelatinized with ether and 2% paraffin. This was adopted for the Lebel rifle. Vieille's powder revolutionized the effectiveness of small guns, because it gave off almost no smoke and was three times more powerful than black powder. Higher muzzle velocity meant a flatter trajectory and less wind drift and bullet drop, making 1000 meter shots practicable. Other European countries swiftly followed and started using their own versions of Poudre B, the first being Germany and Austria which introduced new weapons in 1888. Subsequently, Poudre B was modified several times with various compounds being added and removed. Krupp began adding diphenylamine as a stabilizer in 1888. Britain conducted trials on all the various types of propellant brought to their attention, but were dissatisfied with them all and sought something superior to all existing types. In 1889, Sir Frederick Abel, James Dewar and Dr W Kellner patented (Nos 5614 and 11,664 in the names of Abel and Dewar) a new formulation that was manufactured at the Royal Gunpowder Factory at Waltham Abbey. It entered British service in 1891 as Cordite Mark 1. Its main composition was 58% Nitro-glycerine, 37% Guncotton and 3% mineral jelly. A modified version, Cordite MD, entered service in 1901, this increased guncotton to 65% and reduced nitro-glycerine to 30%, this change reduced the combustion temperature and hence erosion and barrel wear. Cordite could be made to burn slower which reduced maximum pressure in the chamber (hence lighter breeches, etc. ), but longer high pressure, significant improvements over gunpowder. Cordite could be made in any desired shape or size. The creation of cordite led to a lengthy court battle between Nobel, Maxim, and another inventor over alleged British patent infringement. A modern version of the incendiary shell was developed in 1857 by the British and was known as Martin's shell after its inventor. The shell was filled with molten iron and was intended to break up on impact with an enemy ship, splashing molten iron on the target. It was used by the Royal Navy between 1860 and 1869, replacing Heated shot as an anti-ship, incendiary projectile. Similar to incendiary shells were star shells, designed for illumination rather than arson. Sometimes called lightballs they were in use from the 17th Century onwards. The British adopted parachute lightballs in 1866 for 10, 8 and 5​1⁄2 inch calibers. The 10-inch wasn't officially declared obsolete until 1920. Smoke balls also date back to the 17th Century, British ones contained a mix of saltpetre, coal, pitch, tar, resin, sawdust, crude antimony and sulphur. They produced a 'noisome smoke in abundance that is impossible to bear'. In 19th century British service, they were made of concentric paper with a thickness about 1/15th of the total diameter and filled with powder, saltpeter, pitch, coal and tallow. They were used to 'suffocate or expel the enemy in casemates, mines or between decks; for concealing operations; and as signals. With this style of ammunition, there are three main components the fuzed projectile, the casing to hold the propellants and primer, and the single propellant charge. With a fixed round everything is included in one ready to use package and in British ordnance, terms are called fixed quick firing. Often guns which use fixed ammunition use sliding-block or sliding-wedge breeches and the case provides obturation which seals the breech of the gun and prevents propellant gasses from escaping. Sliding block breeches can be horizontal or vertical. Advantages of fixed ammunition are simplicity, safety, moisture resistance and speed of loading. Disadvantages are eventually a fixed round becomes too long or too heavy to load by a gun crew. Another issue is the inability to vary propellant charges to achieve different velocities and ranges. Lastly, there's the issue of resource usage since a fixed round uses a case, which can be an issue in a prolonged war if there are metal shortages. With this style of ammunition there are three main components: The fuzed projectile, the casing to hold the propellants and primer, and the bagged propellant charges. With a separate loading cased charge round the casing, bagged propellant charges and projectile are usually separated into two or more parts. In British ordnance terms, this type of ammunition is called separate quick firing. Often guns which use separate loading cased charge ammunition use sliding-block or sliding-wedge breeches and during World War I and World War II Germany predominantly used fixed or separate loading cased charges and sliding block breeches even for their largest guns. A variant of separate loading cased charge ammunition is semi-fixed ammunition. With semi-fixed ammunition the round comes as a complete package but the projectile and its case can be separated. The case holds a set number of bagged charges and the gun crew can add or subtract propellant to change range and velocity. The round is then reassembled and fired. Advantages include easier handling for large rounds, while range and velocity can be varied by using more or fewer propellant charges. Disadvantages include more complexity, slower loading, less safety, less moisture resistance and the metal cases can still be a resource issue. With this style of ammunition there are three main components - the fuzed projectile, the bagged charges and the primer. Like separate loading cased charge ammunition, the number of propellant charges can be varied. However, this style of ammunition does not use a cartridge case and it achieves obturation through a screw breech instead of a sliding block. Sometimes when reading about artillery the term separate loading ammunition will be used without clarification of whether a cartridge case is used or not, in which case refer to the type of breech used. Heavy artillery pieces and Naval artillery tend to use bagged charges and projectiles because the weight and size of the projectiles and propelling charges can be more than a gun crew can manage. Advantages include easier handling for large rounds, decreased metal usage, while range and velocity can be varied by using more or fewer propellant charges. Disadvantages include more complexity, slower loading, less safety and less moisture resistance. The caliber of a shell is its diameter. Depending on the historical period and national preferences, this may be specified in millimeters, centimeters, or inches. The length of gun barrels for large cartridges and shells (naval) is frequently quoted in terms of the ratio of the barrel length to the bore size, also called caliber. For example, the 16"/50 caliber Mark 7 gun is 50 calibers long, that is, 16"×50=800"=66.7 feet long. Some guns, mainly British, were specified by the weight of their shells (see below). Explosive rounds as small as 12.7 x 82 and 13 x 64 millimeter have been used on aircraft and armored vehicles, but their small explosive yield have led some nations to limit their explosive rounds to 20 mm or larger. International Law precludes the use of explosive ammunition for use against individual persons, but not against vehicles and aircraft. The largest shells ever fired were those from the German super-railway guns, Gustav and Dora, which were 800 mm (31.5 in) in caliber. Very large shells have been replaced by rockets, missiles, and bombs, and today the largest shells in common use are 155 mm (6.1 in). Gun calibers have standardized around a few common sizes, especially in the larger range, mainly due to the uniformity required for efficient military logistics. Shells of 105 and 155 mm for artillery and 105mm and 120 mm for tank guns in NATO. Artillery shells of 122, 130 and 152 mm, and tank gun ammunition of 100, 115, or 125 mm caliber remain in use in Eastern Europe, Western Asia, Northern Africa, and Eastern Asia. Most common calibers have been in use for many years, since it is logistically complex to change the caliber of all guns and ammunition stores. The weight of shells increases by and large with caliber. A typical 155 mm (6.1 in) shell weighs about 50 kg, a common 203 mm (8 in) shell about 100 kg, a concrete demolition 203 mm (8 in) shell 146 kg, a 280 mm (11 in) battleship shell about 300 kg, and a 460 mm (18 in) battleship shell over 1,500 kg. The Schwerer Gustav supergun fired 4.8 and 7.1 tonne shells. During the 19th century, the British adopted a particular form of designating artillery. Field guns were designated by nominal standard projectile weight, while howitzers were designated by barrel caliber. British guns and their ammunition were designated in pounds, e.g., as "two-pounder" shortened to "2-pr" or "2-pdr". Usually, this referred to the actual weight of the standard projectile (shot, shrapnel or HE), but, confusingly, this was not always the case. Some were named after the weights of obsolete projectile types of the same caliber, or even obsolete types that were considered to have been functionally equivalent. Also, projectiles fired from the same gun, but of non-standard weight, took their name from the gun. Thus, conversion from "pounds" to an actual barrel diameter requires consulting a historical reference. A mixture of designations were in use for land artillery from the First World War (such as the BL 60-pounder gun, RML 2.5 inch Mountain Gun, 4 inch gun, 4.5 inch howitzer) through to the end of World War II (5.5 inch medium gun, 25-pounder gun-howitzer, 17-pounder tank gun), but the majority of naval guns were by caliber. After World War II, guns were designated by caliber. With the introduction of the first ironclads in the 1850s and 1860s, it became clear that shells had to be designed to effectively pierce the ship armor. A series of British tests in 1863 demonstrated that the way forward lay with high-velocity lighter shells. The first pointed armor-piercing shell was introduced by Major Palliser in 1863. Approved in 1867, Palliser shot and shell was an improvement over the ordinary elongated shot of the time. Palliser shot was made of cast iron, the head being chilled in casting to harden it, using composite molds with a metal, water cooled portion for the head. Britain also deployed Palliser shells in the 1870s-1880s. In the shell, the cavity was slightly larger than in the shot and was filled with 1.5% gunpowder instead of being empty, to provide a small explosive effect after penetrating armor plating. The shell was correspondingly slightly longer than the shot to compensate for the lighter cavity. The powder filling was ignited by the shock of impact and hence did not require a fuze. However, ship armor rapidly improved during the 1880s and 1890s, and it was realised that explosive shells with steel had advantages including better fragmentation and resistance to the stresses of firing. These were cast and forged steel. 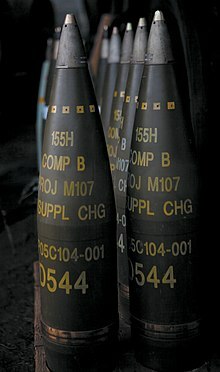 AP shells containing an explosive filling were initially distinguished from their non-HE counterparts by being called a "shell" as opposed to "shot". 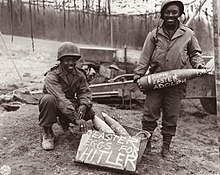 By the time of the Second World War, AP shells with a bursting charge were sometimes distinguished by appending the suffix "HE". At the beginning of the war, APHE was common in anti-tank shells of 75 mm caliber and larger due to the similarity with the much larger naval armor piercing shells already in common use. As the war progressed, ordnance design evolved so that the bursting charges in APHE became ever smaller to non-existent, especially in smaller caliber shells, e.g. Panzergranate 39 with only 0.2% HE filling. Although smokeless powders were used as a propellant, they could not be used as the substance for the explosive warhead, because shock sensitivity sometimes caused detonation in the artillery barrel at the time of firing. Picric acid was the first high-explosive nitrated organic compound widely considered suitable to withstand the shock of firing in conventional artillery. In 1885, based on research of Hermann Sprengel, French chemist Eugène Turpin patented the use of pressed and cast picric acid in blasting charges and artillery shells. In 1887, the French government adopted a mixture of picric acid and guncotton under the name Melinite. In 1888, Britain started manufacturing a very similar mixture in Lydd, Kent, under the name Lyddite. Japan followed with an "improved" formula known as shimose powder. In 1889, a similar material, a mixture of ammonium cresylate with trinitrocresol, or an ammonium salt of trinitrocresol, started to be manufactured under the name ecrasite in Austria-Hungary. By 1894, Russia was manufacturing artillery shells filled with picric acid. Ammonium picrate (known as Dunnite or explosive D) was used by the United States beginning in 1906. Germany began filling artillery shells with TNT in 1902. 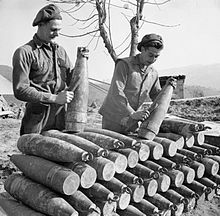 Toluene was less readily available than phenol, and TNT is less powerful than picric acid, but the improved safety of munitions manufacturing and storage caused the replacement of picric acid by TNT for most military purposes between the World Wars. However, pure TNT was expensive to produce and most nations made some use of mixtures using cruder TNT and ammonium nitrate, some with other compounds included. These fills included Ammonal, Schneiderite and Amatol. The latter was still in wide use in World War II. The percentage of shell weight taken up by its explosive fill increased steadily throughout the 20th Century. Less than 10% was usual in the first few decades; by World War II, leading designs were around 15%. However, British researchers in that war identified 25% as being the optimal design for anti-personnel purposes, based on the recognition that far smaller fragments than hitherto would give a better effect. This guideline was achieved by the 1960s with the 155 mm L15 shell, developed as part of the German-British FH-70 program. The key requirement for increasing the HE content without increasing shell weight was to reduce the thickness of shell walls, which required improvements in high tensile steel. The most common shell type is high explosive, commonly referred to simply as HE. They have a strong steel case, a bursting charge, and a fuse. The fuse detonates the bursting charge which shatters the case and scatters hot, sharp case pieces (fragments, splinters) at high velocity. Most of the damage to soft targets, such as unprotected personnel, is caused by shell pieces rather than by the blast. The term "shrapnel" is sometimes used to describe the shell pieces, but shrapnel shells functioned very differently and are long obsolete. The speed of fragments is limited by Gurney equations. Depending on the type of fuse used the HE shell can be set to burst on the ground (percussion), in the air above the ground, which is called air burst (time or proximity), or after penetrating a short distance into the ground (percussion with delay, either to transmit more ground shock to covered positions, or to reduce the spread of fragments). Projectiles with enhanced fragmentation are called high-explosive fragmentation (HE-FRAG). RDX and TNT mixtures are the standard chemicals used, notably Composition B and Cyclotol. The introduction of 'insensitive munition' requirements, agreements and regulations in the 1990s caused modern western designs to use various types of plastic bonded explosives (PBX) based on RDX. Common shells designated in the early (i.e. 1800s) British explosive shells were filled with "low explosives" such as "P mixture" (gunpowder) and usually with a fuze in the nose. Common shells on bursting (non-detonating) tended to break into relatively large fragments which continued along the shell's trajectory rather than laterally. They had some incendiary effect. As at 1914, common shells 6 inch and up were of cast steel, smaller shells were of forged steel for service and cast iron for practice. They were replaced by "common lyddite" shells in the late 1890s but some stocks remained as late as 1914. In British service common shells were typically painted black with a red band behind the nose to indicate the shell was filled. Common pointed shells, or CP were a type of common shell used in naval service from the 1890s - 1910s which had a solid nose and a percussion fuze in the base rather than the common shell's nose fuze. The ogival two C.R.H. solid pointed nose was considered suitable for attacking shipping but was not armor-piercing - the main function was still explosive. They were of cast or forged (three- and six-pounder) steel and contained a gunpowder bursting charge slightly smaller than that of a common shell, a trade off for the longer heavier nose. By World War II they were superseded in Royal Navy service by common pointed capped (CPC) and semi-armor piercing (SAP), filled with TNT. Common lyddite shells were British explosive shells filled with Lyddite were initially designated "common lyddite" and beginning in 1896 were the first British generation of modern "high explosive" shells. Lyddite is picric acid fused at 280 °F and allowed to solidify, producing a much denser dark-yellow form which is not affected by moisture and is easier to detonate than the liquid form. Its French equivalent was "melinite", Japanese equivalent was "shimose". Common lyddite shells "detonated" and fragmented into small pieces in all directions, with no incendiary effect. For maximum destructive effect the explosion needed to be delayed until the shell had penetrated its target. Shrapnel shells are an anti-personnel munition which delivered large numbers of bullets at ranges far greater than rifles or machine guns could attain - up to 6,500 yards by 1914. A typical shrapnel shell as used in World War I was streamlined, 75 mm (3 in) in diameter and contained approximately 300 lead–antimony balls (bullets), each around 1/2 inch in diameter. Shrapnel used the principle that the bullets encountered much less air resistance if they travelled most of their journey packed together in a single streamlined shell than they would if they travelled individually, and could hence attain a far greater range. The gunner set the shell's time fuze so that it was timed to burst as it was angling down towards the ground just before it reached its target (ideally about 150 yards before, and 60–100 feet above the ground). The fuze then ignited a small "bursting charge" in the base of the shell which fired the balls forward out of the front of the shell case, adding 200–250 ft/second to the existing velocity of 750–1200 ft/second. The shell body dropped to the ground mostly intact and the bullets continued in an expanding cone shape before striking the ground over an area approximately 250 yards × 30 yards in the case of the US 3 inch shell. The effect was of a large shotgun blast just in front of and above the target, and was deadly against troops in the open. A trained gun team could fire 20 such shells per minute, with a total of 6,000 balls, which compared very favorably with rifles and machine-guns. However, shrapnel's relatively flat trajectory (it depended mainly on the shell's velocity for its lethality, and was lethal only in the forward direction) meant that it could not strike trained troops who avoided open spaces and instead used dead ground (dips), shelters, trenches, buildings, and trees for cover. It was of no use in destroying buildings or shelters. Hence, it was replaced during World War I by the high-explosive shell, which exploded its fragments in all directions (and thus more difficult to avoid) and could be fired by high-angle weapons, such as howitzers. Cluster shells are a type of carrier shell or cargo munition. Like cluster bombs, an artillery shell may be used to scatter smaller sub-munitions, including anti-personnel grenades, anti-tank top-attack munitions, and landmines. These are generally far more lethal against both armor and infantry than simple high-explosive shells, since the multiple munitions create a larger kill zone and increase the chance of achieving the direct hit necessary to kill armor. Most modern armies make significant use of cluster munitions in their artillery batteries. However, in operational use, sub-munitions have demonstrated a far higher malfunction rate than previously claimed, including those that have self-destruct mechanisms. This problem, the "dirty battlefield", led to the Ottawa Treaty. Signatories of the Ottawa Treaty have renounced the use of cluster munitions of all types where the carrier contains more than ten sub-munitions. 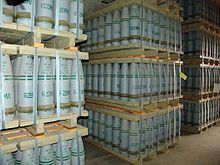 155 mm artillery shells containing HD (nitrogen mustard) agent at Pueblo chemical weapons storage facility – Note the colour-coding scheme on each shell. Base ejection smoke is usually white, however, colored smoke has been used for marking purposes. The original canisters were non-burning, being filled with a compound that created smoke when it reacted with atmospheric moisture, modern ones use red phosphorus because of its multi-spectral properties. However, other compounds have been used; in World War II, Germany used oleum (fuming sulfuric acid) and pumice. A modern illumination shell has a time fuze that ejects a flare 'package' through the base of the carrier shell at a standard height above ground (typically about 600 metres), from where it slowly falls beneath a non-flammable parachute, illuminating the area below. The ejection process also initiates a pyrotechnic flare emitting white or 'black' infrared light. Colored flare shells have also been used for target marking and other signaling purposes. The carrier shell is simply a hollow carrier equipped with a fuze that ejects the contents at a calculated time. They are often filled with propaganda leaflets (see external links), but can be filled with anything that meets the weight restrictions and is able to withstand the shock of firing. Famously, on Christmas Day 1899 during the siege of Ladysmith, the Boers fired into Ladysmith a carrier shell without a fuze, which contained a Christmas pudding, two Union Flags and the message "compliments of the season". The shell is still kept in the museum at Ladysmith. A proof shot is not used in combat but to confirm that a new gun barrel can withstand operational stresses. The proof shot is heavier than a normal shot or shell, and an oversize propelling charge is used, subjecting the barrel to greater than normal stress. The proof shot is inert (no explosive or functioning filling) and is often a solid unit, although water, sand or iron powder filled versions may be used for testing the gun mounting. Although the proof shot resembles a functioning shell (of whatever sort), so that it behaves as a real shell in the barrel, it is not aerodynamic as its job is over once it has left the muzzle of the gun. Consequently, it travels a much shorter distance and is usually stopped by an earth bank for safety measures. The gun, operated remotely for safety in case it fails, fires the proof shot, and is then inspected for damage. If the barrel passes the examination, "proof marks" are added to the barrel. The gun can be expected to handle normal ammunition, which subjects it to less stress than the proof shot, without being damaged. M712 Copperhead approaches a target tank. Modern 155 mm artillery ammunition – these shells are unusual in having two driving bands. The shell on the right is a modified M107. ^ "shells" – via The Free Dictionary. ^ "Etymology of grenade". Etymonline.com. 8 January 1972. Retrieved 27 February 2013. ^ a b Needham, Joseph. (1986). Science and Civilization in China: Volume 5, Chemistry and Chemical Technology, Part 7, Military Technology; the Gunpowder Epic. Taipei: Caves Books Ltd. Page 24–25, 264. ^ Franzkowiak, Andreas; Wenzel, Chris (2016). "Explosives aus der Tiefgarage - Ein außergewöhnlicher Keramikgranatenfund aus Ingolstadt". Sammelblatt des historischen Vereins Ingolstadt (in German). 125: 95–110. ISSN 1619-6074. ^ Marshall J. Bastable (1992). "From Breechloaders to Monster Guns: Sir William Armstrong and the Invention of Modern Artillery, 1854-1880". Technology and Culture. 33: 213. doi:10.2307/3105857. ^ Nicolas Édouard Delabarre-Duparcq and George Washington Cullum. Elements of Military Art and History. 1863. p 142. ^ Philip Jobson (2 September 2016). Royal Artillery Glossary of Terms and Abbreviations: Historical and Modern. History Press. ISBN 978-0-7509-8007-4. ^ a b c Hogg, Ian (1972). Artillery. Batchelor, John H. New York,: Scribner. ISBN 0684130920. OCLC 571972. ^ "Build a Free Website with Web Hosting - Tripod". members.lycos.co.uk. ^ "Treatise on Ammunition", 4th Edition 1887, pp. 203-205. ^ (Organization), Human Rights Watch (31 July 2018). "Rain of Fire: Israel's Unlawful Use of White Phosphorus in Gaza". Human Rights Watch – via Google Books. ^ "Ordnance & Munitions Forecast" (PDF). www.forecastinternational.com. 2010. ^ Treatise on Ammunition (1915), pp. 158, 159, 198. ^ Treatise on Ammunition (1915), p. 161. ^ Treatise on Ammunition (1915), pp. 37, 158, 159, 198. ^ I.V. Hogg & L.F. Thurston, British Artillery Weapons & Ammunition. London: Ian Allan, 1972. Page 215.